Fascia Transversalis is the inner outermost layer of the transversus abdominis muscle which is lined by a thin layer of fascia. 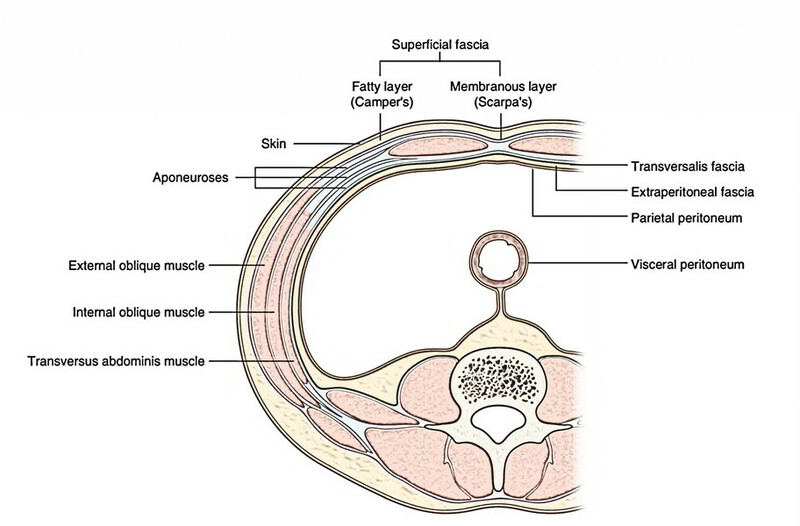 Anterior and posterior surfaces of each of the three flat muscles is covered by a layer of deep (or investing) fascia. Generally, the layer deep to the transversus abdominis muscle (the transversalis fascia) is remarkable, which is better developed otherwise these layers are unremarkable. After attaching to the crest of the ilium, the transversalis fascia blends with the fascia covering the muscles associated with the upper regions of the pelvic bones and with similar fascia covering the muscles of the pelvic cavity. At this point, it is referred to as the parietal pelvic (or endo-pelvic) fascia. Superiorly, it’s constant with the quite similar layer lining the inferior aspect of the diaphragm- the diaphragmatic fascia and inferiorly with the fascia lining the iliacus muscle – the fascia iliaca. Anteriorly, it goes up to the linea alba to which it becomes adherent, and posteriorly it becomes continuous with the anterior layer of the thoraco-lumbar fascia. The fascia transversalis presents an oval opening about 1.2 cm above the midinguinal stage named deep inguinal ring which gives passage to the spermatic cord in male and round ligament of the uterus in female. It creates a tubular prolongation around the spermatic cord in the creation of internal spermatic fascia. Its prolongation into the thigh over the femoral vessels creates the anterior wall of the femoral sheath. All the primary arteries of the abdominal cavity be located deep to the fascia transversalis on the other hand chief nerves be located outside it. This clarifies why femoral vessels are inside the femoral sheath and femoral nerve outside it. It creates iliopubic tract, which is the thickened inferior margin of the fascia transversalis in the inguinal region. This tract appears as a fibrous band running parallel and posterior (deep) to the inguinal ligament. No muscle fibres are cut across. It provides access to either side of the abdomen. The disadvantage of supra-umbilical incision is the fact that healing is inferior and can result in incisional hernia. The infra-umbilical incision is safer as a result of the close approximation of recti prevents the ventral incisional hernia. This incision is sounder in relation to the median incision. The anterior wall of rectus sheath is exposed and incised about 1 inch (2.5 cm) lateral and parallel to the midline. The anterior wall of the sheath is freed from the tendinous intersections. The rectus muscle is retracted laterally with its Nerve Supply complete and posterior wall of the sheath is exposed. The posterior wall of the sheath together with fascia transversalis and peritoneum is subsequently incised. The wound is closed in layers. In paramedian incision, postoperative weakness and incidence of incisional hernia is minimal. Thus, it’s given most often. It’s typically given for appendicectomy. An oblique incision is created in the region of the right iliac fossa about 2 inches (5 cm) above and medial to the anterior superior iliac spine at right angle to the spino-umbilical line. The external oblique, internal oblique, and transversus abdominis muscles are incised or carve in the line of their fibres and retracted to expose the fascia transversalis. Thus, it’s also referred to as muscle-splitting incision. The transversalis fascia and parietal peritoneum are incised to open the abdominal cavity, the incision isclosed in layers. This incision has no postoperative weakness. It’s given 2 to 5 cm below and parallel to the right costal margin. This incision is utilized to investigate the gallbladder and related ducts. Transverse incision: The transverse incision in the lower part of the abdomen (with slight concavity upward) is given about 2 cm below the umbilicus along the skin crease (line of Venus). It’s utilized to learn more about the pelvic organs, particularly in operations linked to the uterus and ovaries.